The Buzz About Epsom Salt – Political & Current Affairs Blog Published by Celeste Greig. For your health, beauty and home……. Epsom salt, which is not really a salt at all but a mineral compound comprised of magnesium and sulfate, gets its named from a saline spring at Epsom in Surrey, England. Epsom salt has been used for centuries as a natural remedy for a number of ailments, and also has many beauty, gardening and household uses. Both magnesium and sulfate are readily absorbed into the skin, which makes their health benefits readily accessible. Over 325 enzymes in the body are regulated by magnesium, which also helps reduce inflammation, alleviates hardening of the arteries and improves muscle and nerve function. Sulfates improve the rate at which nutrients are absorbed and help to flush out toxins. An Epsom salt bath is a great way to soothe sore muscles, cramps, bruises and joint pain. Because of this, it is a great after-workout soak. In addition, soaking in an Epsom salt bath is a wonderful way to relax and relieve stress. Add 2 cups of salts to a warm bath. Mix the salt in so it dissolves in the water. Soak for 10-15 minutes for best results. As we shed our skin naturally, the buildup of dead skin cells clogs pores and can cause blemishes. Exfoliation is necessary to keep skin healthy, glowing and vibrant. The best way to exfoliate with Epsom salts is to massage handfuls all over the body in the shower or bath. Your skin will feel soft and fresh with this homemade spa treatment. Mix ½ cup of baby oil with ½ cup of water, and add ¼ cup of Epsom salts and a few drops of your favorite essential oil. Set this homemade mixture next to your sink for a nice bathroom hand wash.
A compress made with Epsom salts is a great way to treat mosquito bites, bee stings and poison ivy. Mix 2 tablespoons of salts with 1 cup of warm water. Soak a clean cloth in the mixture and hold on affected area to remove pain, burning and itching. Your face need to be cleaned and exfoliated just like the rest of your body. Put a teaspoon of Epsom salts in your hand and mix with a little warm water. Scrub your face with the mixture then rinse clean. This facial cleaner not only exfoliates and rejuvenates but also helps remove blackheads and prevent acne. Splinters can be tricky and painful to remove. Skip the needles and soak your splintered skin in an Epsom salt bath. The salts will draw the splinter out and leave the area clean. Dry, flakey, cracking lips are not only unsightly but also painful. Heal this uncomfortable condition with a homemade Epsom salt lip balm. Mix equal parts organic coconut oil and Epsom salts. Apply to lips generously to exfoliate and moisturize. Bathroom and kitchen tile grime can be difficult to clean. Powerful tile cleaners are not only expensive, but also often contain harmful chemicals. Make your own hard-working natural Epsom salt tile scrub. Mix equal parts liquid dish soap with epsom salts. Scrub onto tiles with a sponge and rinse clean with water. Mix ¼ cup of Epsom salts with 2 cups of water and place in a spray bottle. Spray the mixture around your home and garden to safely deter insects without the use of chemical insecticides. Epsom salts are a great way to relieve constipation. Mix 2 teaspoons of Epsom salts in a glass of water. Drink entire cup for best results. If the taste is not appealing to you, try mixing with fresh juice instead. Epsom salts make a wonderful fertilizer for your lawn and potted plants. For greener grass, mix 1 cup of the salts for every gallon of water and spray over lawn area. To fertilize potted plants, simply sprinkle Epsom salts around the base of the plants once every week. This method of fertilizing also works great for tomatoes and other veggies. An Epsom salt bath is a wonderful way to draw toxins out of your body. Soaking in a bath for 10-15 minutes is also a great way to reduce swelling. Mix 1-2 cups of Epsom salts in a warm bath and mix to dissolve in water. Epsom salts combined with a little essential oil makes a perfect fabric softener for your laundry. In addition, the salts will help remove detergent buildup from your washer. 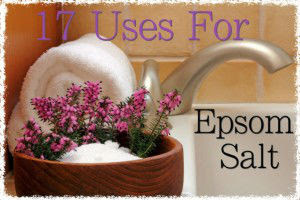 Mix 4 cups epsom salts with 20 drops of your favorite essential oil. Add ¼ cup to each load of laundry. Soaking your feet in Epsom salts not only reduces swelling and draws out toxins, but also zaps odors and foot fungus. Add ¼ cup to a large container of warm water. Soak feet for 10-15 minutes. Soaking in an Epsom salt bath is a great way to soothe skin irritated by sunburn. Mix 1 cup of salts in warm bath water. Mix to combine and soak in the bath for 10-15 minutes. Epsom salts make a great deep conditioner to add volume and remove grease from your hair. Combine equal parts of organic hair conditioner and Epsom salts and apply liberally to hair. Let sit for 20 minutes, then rinse clean. You know that soaking your feet in epsom salts is healthy, but what about your hands? Soaking your hands is a great way to soothe rough skin, calm aching finger joints, remove nail polish and remove any dirt from under your nails. Add 1/4 cup of Epsom salts to a large bowl of warm water. Soak hands in mixture for 5-10 minutes.